Dozens of learners have used our Revision Mastery Coaching to boost confidence and pass their exams. As well as the 1-to-1 coaching sessions you'll get lifetime access to the relevant Revision Mastery series to compliment your exam revision. The coaching and Revision Mastery Series maps directly to your manual, your exam and the leading awarding bodies. Learn anywhere, anytime by gaining access to your 1-to-1 tutor and the Parallel Coaching Academy below. 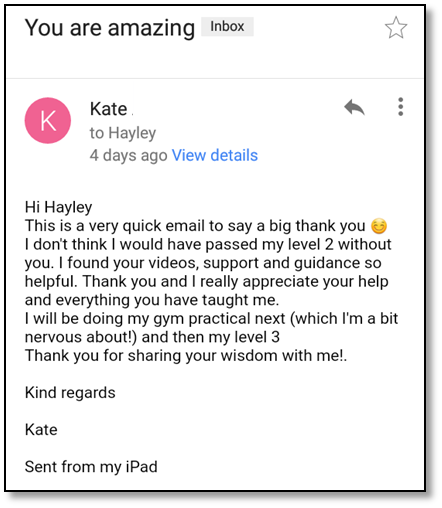 Are you studying to become a level 2 or level 3 fitness professional? That could be level 2 Fitness Instructor, Level 2 Exercise To Music Instructor, Level 3 Personal Trainer, Sport Massage Therapist, Yoga or Pilates? Maybe you are studying with another training provider, aiming to pass your fitness exam first time or complete a resit. Either way, you feel lost with your studies, trying desperately to learn from a single course manual and scouring the web for more information. Feeling frustrated and overwhelmed, staring at your course manual for hours on end, whilst nothing seems to go in! Most people find it frustrating to learn from a course manual, left to figure out what to learn and how this new info fits into the exam. Imagine being able to watch and listen to the "Ins & Outs" of your course manual, being able to press pause, stop, fast forward and rewind whenever and where ever you like... alongside having cheat sheets and practice questions to test yourself as you go! That’s exactly what the Revision Mastery Coaching allows you to do. You will work with your tutor 1-to-1 across 4 sessions to ensure your studies stay on track and guided towards your exam. You'll also get unlimited and lifetime access to the relevant online Revision Mastery Series to compliment your home studies and further your knowledge again. Here you will get between 6 and 8 full HD video modules that break down complex topics in your course manual into simple analogies and metaphors, meaning you learn quicker, and become 100% confident to pass your exam. In fact 99% of those who enroll on the Revision Mastery Coaching pass their exam first time with top marks. Each 1-to-1 session lasts approximately 1 hour and is online via a web-link. Prior to starting the first session you will complete a learning diagnostic task. This will clearly identify how you learn best and will guide your learning plan and all 4 sessions to ensure you get the most from your dedicated tutor. 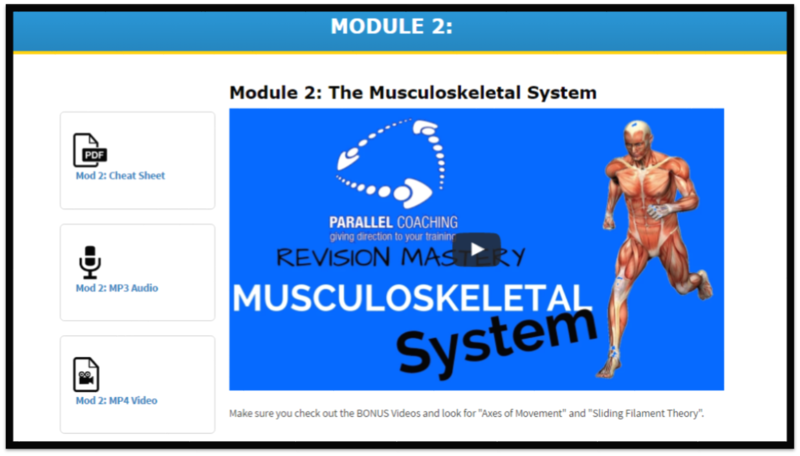 BONUSES: Each video module inside the relevant Revision Mastery Series includes cheat sheets, our instant learning hacks video series, the 7 secrets success guide and previously unseen mock questions. Each video module can be downloaded to MP3 and MP4, meaning you can learn and revise, anywhere anytime without WiFi. The Revision Mastery Coaching is mapped to the Active IQ, CYQ and VTCT syllabus, making sure you are learning exactly what you need to for your exam. We’ve made learning stress free and fun! Even the "self-confessed non-Techies" found it easy to use! Diagnostic and Personalised Learning Report - here you UNLOCK how you learn best! Please follow the "BOOK MY CALL" button below to start your application and discuss where you are with your studies and what exam you are taking. During this call you will establish a clear learning plan, identify areas in your learning that need focus and prepare you for your first 1-2-1 coaching session. Also full payment will be made or a deposit taken during the call to secure your enrolment. The call is usually with Hayley or Neale and last 10 to 15 minutes. Please come to the call prepared with questions about your studies that you feel need addressing! Throughout the 4x coaching sessions you will dive deep into the exam modules that you struggle on. Your dedicated tutor will break down complex topics and ensure you are left knowing and not guessing. You can reach out to your tutor at any time and ask as many questions as you need, therefore feeling more certain and confident as you head into your exam. You will also have unlimited access to the relevant Revision Mastery Series. Each video is approximately 45 minutes long and details the complete “Ins & Outs” of the each module of your fitness exam. Each video is interactive, works alongside the downloadable cheat sheet and maps directly to Active IQ, CYQ and VTCT exams. There is no assessment for the revision mastery coaching. It is designed to leave you competent and confident for your fitness exam, with your current training provider. If you find learning and revising from a course manual tough, frustrating and hard to absorb, this interactive revision coaching will 100% help! 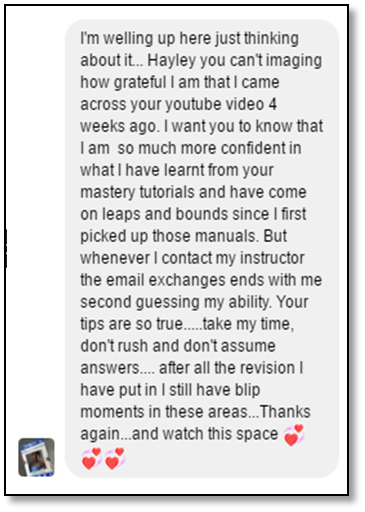 Check out the testimonials above and see what other learners are saying!